Puerto Vallarta, Mexico - "It pops, it's alive, and my work grabs you," says Diane Walsh as she describes her art. But painting has not always grabbed Diane Walsh and in 2010 she discovered her hidden talent. "I had a girlfriend who needed a tenth person to go to a four day, four hour workshop for painting and of course I said, how silly, I don't know how to paint and she said it doesn't matter, it's just for fun and you have to join us, so I joined her and that was the beginning," says Diane. "What happened was I found out I could paint, and it was exciting and it was novel and I thought, this is easy, why didn't I start it 30 or 40 years ago. But I'm doing it now and I'm loving it and I'm having a great time with it." Diane's work has evolved from oil portraits to multi-media including metal leaf, acrylic, glass and resin. Her work space provides the perfect environment for creativity. Diane's studio is in her house high in the hills of Conchas Chinas. She finds the most wonderful thing about it is that it is open-air. She says she is lucky enough to have the ability to work in a beautiful climate and to work outside and to have gorgeous scenery around for inspiration. "I have a table set-up here, I have all my supplies behind me, all within easy reach," says Diane, "I stand when I paint, I work on a table top for most of my artwork, I do work on easel when I'm doing portrait work or nudes, but for my acrylics and for my multi-media, I work on top of a table." Diane says the light is always right but this isn't the only reason she lives about seven months out of the year in Puerto Vallarta and spends the rest of her time in Vancouver. "It's like living in paradise," says Diane, "Every time I go out I see something new I want to paint. I just don't have enough time in the day to get everything I want to get down on canvas that I see all around me." In the year 2000 Diane and her husband decided they were going to live somewhere else during their latter years. They traveled extensively through Europe, but they decided that it was too cold and their was too much of a time difference. Then they thought, why not Mexico. They got in their car and drove down and managed to hit every little town on the western seaboard, and when they got to Puerto Vallarta, they knew that was it. This mother of three and grandmother to six wants to share her enthusiasm for her new art with the world. Her first showing was at her home/studio on March 4, 2012 and she was more than happy with a turn out of around 100 and selling several pieces. "I think about the finished product," says Diane as she paints, "Because I've already got it in my mind and I want to make sure it looks like it should and it does, so I'm happy with it and if I'm happy with it, I smile." Passion Unleashed by Diane Walsh. Diane's art can be purchased online at DianeWalshArt.com, where you can see her works or contact her to arrange for a personal showing. 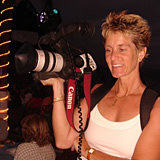 After having spent 10 years in the world of US broadcast news, Laura Gelezunas decided to unleash her skills on Puerto Vallarta by opening Video Diva Productions, a full-service, professional digital video and marketing company. Whether using a video, print and/or photography format, Video Diva Productions guarantees timely delivery of top-notch advertising, promotion, publicity, public and media relations in English, Spanish and French. For more information, click HERE or visit her website at VideoDivaProductions.com.